Releasing this month, True Honor is the third installment in Multnomah Publishers’ “Uncommon Heroes” series of military romance novels. 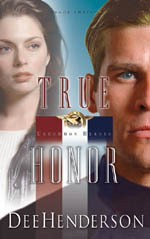 Author Dee Henderson was still writing True Honor during last year’s terrorist attacks on September 11. In the pages of True Honor, readers will encounter CIA officer Darcy St. James who takes the September 11 attacks very personally, as friends have died at the Pentagon. Now, she’s hot on the trail of a man who knew the attacks were going to happen and chose to profit from that knowledge. Dee Henderson’s books have combined sales of over 700,000 and have won a host of awards, including the RITA, Bookseller’s Best, and National Reader’s Choice Awards.